The Overland Park, KS team put together a back-to-school campaign for NETS Developmental League and collected backpacks full of school supplies for low income families in the Kansas City metro area. The office made a competition of it and divided into four teams with the goal of winning bragging rights and a pizza party. They managed to donate 119 backpacks to the organization. Great work, team! You may recall our coverage of the OP team's Make-A-Wish Foundation efforts in our June newsletter about the Kansas office. 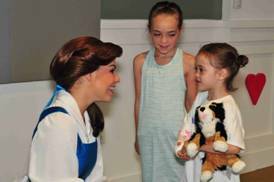 The team raised money to send five-year old Natalie to Disney World. We now have the update from her trip..
Little Natalie had the trip of a lifetime, which started off a bit rocky after an accident resulting in a broken arm. But once her arm was in a cast, she was off on her first-ever plane ride. Natalie and her family stayed at Give Kids the World Village where ice cream was served for breakfast EVERY DAY. They met Disney characters, enjoyed the theme park's many rides, went fishing and played putt-putt. After a whirlwind trip in Orlando, the family drove to Coco Beach where the kids experienced the ocean for the first time. Their time in Florida ended with a tour of the Kennedy Space Center. The Webb family is so grateful to the Aftermarket team for making this trip a reality! Our Colorado coworkers are selling breakfast burritos every Thursday with all funds raised going toward the Children's Heritage Foundation. Keep it up! Your hungry coworkers thank you! The San Diego and Carlsbad employees raised money during their summer picnic event, Summerfest, for Children's Heritage Foundation. For small to large donations, our executive team had to don baby outfits and race each other around the park in giant big wheel bikes. There were tears...of joy and loads of cash raised - $2,521 to be exact. Way to go you big babies! The SoCal team lead by ACM held their annual Golf Tournament fundraiser for Rett Syndrome in July and we're anxiously awaiting the final tally of funds raised at that event. We already know they raised a whopping $6,592 in-house alone! Congrats, ACM! San Diego's next charity in September will be focused on gathering donations for San Pasqual Academy, a teen foster center in Escondido, CA. Details on how to participate will be provided soon. Everyone will be able to help us raise money for Doctors Without Borders. Emails will be sent to all offices once details on how to participate are finalized. The San Diego office will be holding a bake sale in October for Doctors Without Borders, serving food at a soup kitchen in November and donating gifts in our annual participation with Adopt-A-Family. Stay tuned for more ways to help.